Every great road trip starts with a fun vehicle. But driving a Tesla kicks that way up a notch with its undeniable “Wow” factor. 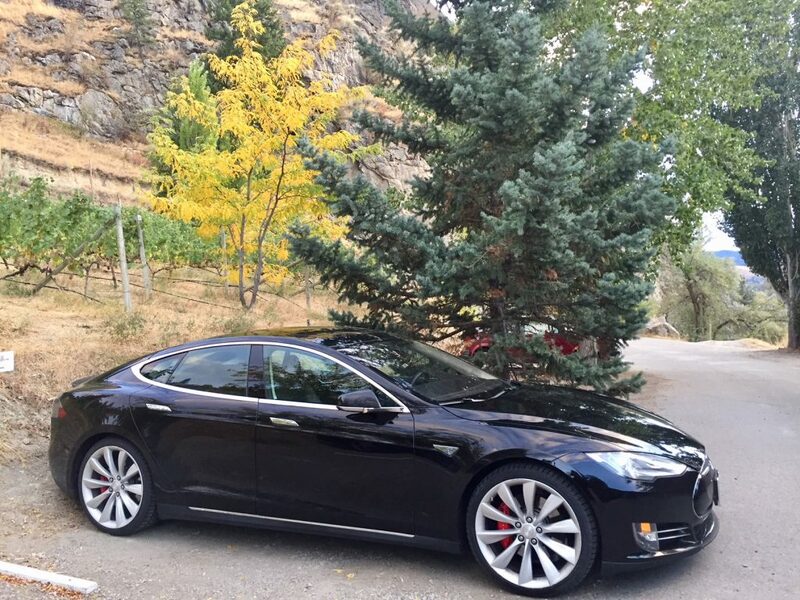 Just imagine Lucy & Ethel or Thelma & Louise behind the wheel of a luxury electric car like our Tesla Model S P85 sedan all-wheel drive, and you have some idea of our grand adventure. 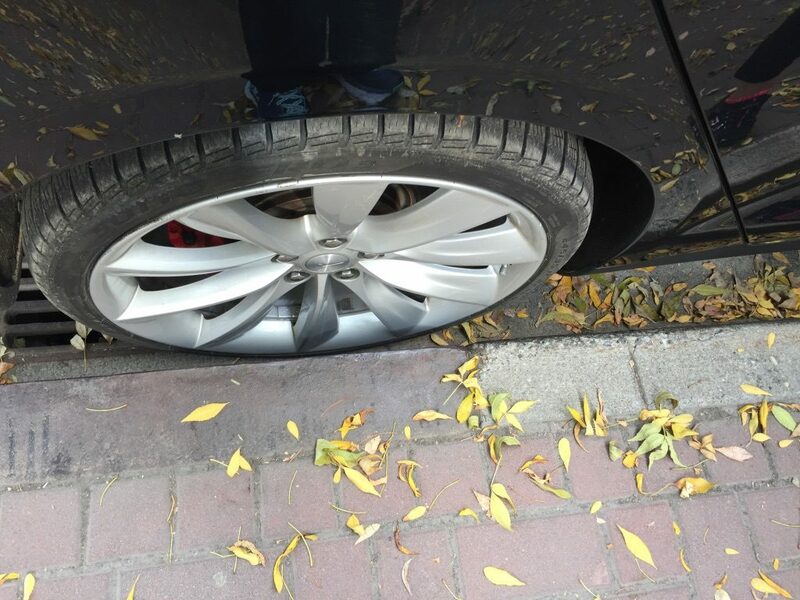 When a neighbor heard of our pending trip, he said, “You do know that the Tesla can go from 0 to 60 in a nanosecond, don’t you?” I didn’t, but not to worry. I knew we’d figure it out. And we did. After landing at Kelowna Airport, we met up with Ryan, our host from Power Trips, who offered a quick, but thorough, orientation on driving our Tesla before turning over the keys – or rather the key fob for our remote car entry. With its cool feature of door handles that slide out when sensing your approach, Tesla had us hooked from the start. We were off, not quite in a nanosecond, since we still had to make it out of the parking lot and onto the freeway (in our case an adventure in itself), but soon enough. And what’s a great road trip without an accompanying playlist? Once we got familiar with the display panel and settled on our eclectic choices (from Bobby Darin to the Beatles, Beach Boys and more – MUCH more), we eased into the sublime comfort of driving our luxury model. It’s a heady feeling knowing you can accelerate instantly at the slightest pedal to the mettle. Then add the fun of causing more than a few head turns while you whizz along the highway. 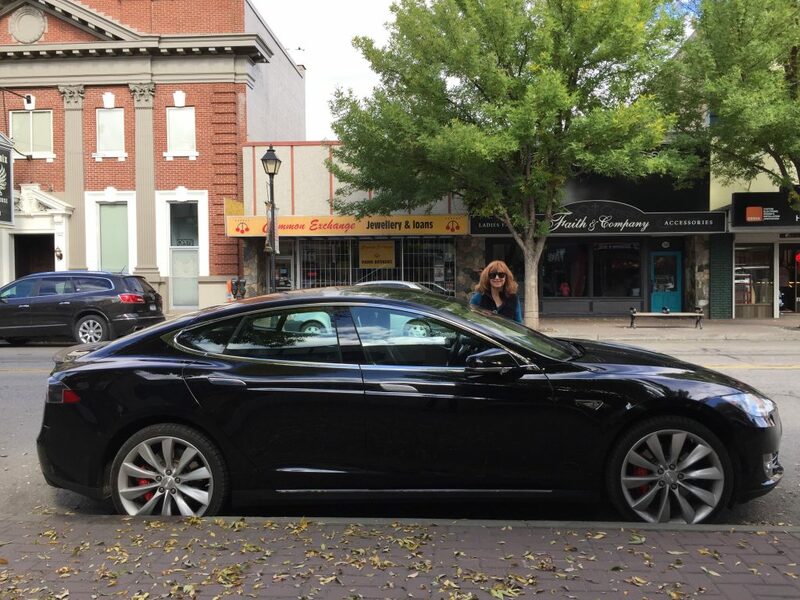 After watching us park perfectly in downtown Vernon, a passerby backed up a few steps and said: “Mind if I ask how much this car cost?” My girlfriend and I looked at each other, then responded: “Umm. About $150,000.” Was it wrong of us not to mention that was the “new” price or that we were only renting the Tesla for our girlfriend getaway? At several more stops on our road trip, people asked what it was like to drive one (“Exhilarating!”), how far we could drive without recharging (“426km, almost 265 miles, per charge.”), or in one case, how we had even managed to get our hands on one since his girlfriend had been on the waitlist for the last six months. If you’re not used to driving an electric car, expect some mental and physical adjustment, like shifting from driving an automatic to a stick-shift. Besides overcoming the twitch to turn the key in the ignition, we also had to get used to the sounds of silence. We marveled at how quiet the model was, so quiet in fact, that even after the engine was on, it was hard to tell if it was actually running. And if we couldn’t hear it, that meant that the people standing in front of our car couldn’t hear it either so we couldn’t assume they would simply move out of the way when we were ready to pull out of our space in the parking lot. Driving a Tesla means no gas stops needed, but you do need charging stations. Ryan had assured us we’d have no problem finding any along Route 97, and he was right. How cool to know that while we were off exploring wineries, golf resorts or even staying at our resort, we could recharge the Tesla for as little or as long as needed. Plus, at many destinations, we discovered that valet service is only to happy to help out, even if the team needs to go to YouTube for advice. Just know that charging times vary, depending on whether using a Tesla destination charger (up to 8 hours for a full charge) or a Tesla Supercharger (typically 45 – 60 minutes). Our car also came with an adapter, so if we had needed to (We didn’t) we also could have used any electric vehicle charging stations along the route. Besides the sheer fun of driving such a cool car, the ultimate payoff of getting behind the wheel of a Tesla is knowing that you’re in a vehicle with top energy efficiency and minimal environmental impact. How about you, Wanderboomers? Have you driven a Tesla? Share your experience with us here. 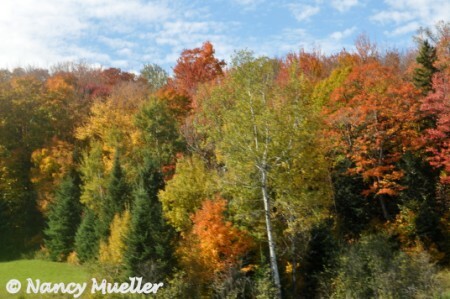 Add Québec road trips to your travel list for the ultimate Autumn getaway. 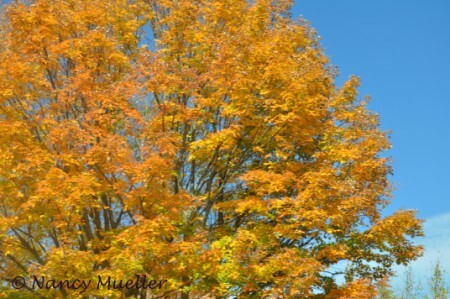 Luckily, my trip coincided with the peak of Fall’s fiery foliage. 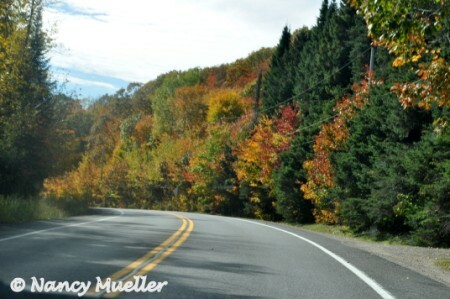 On a spa-hopping mission through Mauricie and Lanaudière outside Montreal (somebody had to do it), I reveled in the journey, inhaling the Fall fragrance, French language and culture of the region. 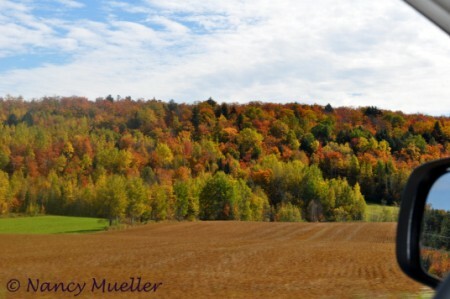 With a happy heart, I took to the open road, absorbed by the beauty of Fall’s vibrant splashes of red, purple and gold. Très magnifique! Any concerns created by cancelled flights getting here soon slipped away. I followed the path of least resistance, soaking up the sun and the scenery along meandering country roads, imprinting the colorful landscape, small farms, and churches in my mind’s eye. I love the wild beauty of the Pacific Northwest. 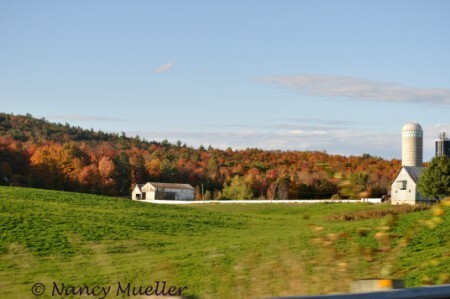 But my trip back East reminded me why Autumn had always been my favorite season as a child in Upstate New York. Inspired to take your own Québec road trips? Plan your journey, pick up a road map and brush up on your French. Settle back and enjoy the drive . . .
For more fun Friday photos, check out Delicious Baby. 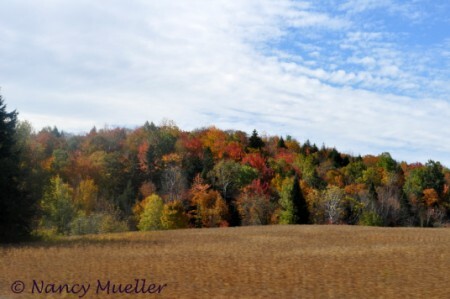 What’s your favorite Fall getaway, Wanderboomers? Share yours with us here. You know you’re getting older when . 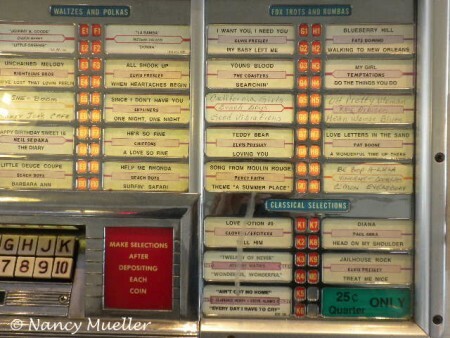 . . when your tween takes one look at a really cool jukebox and says, “What’s that! ?” Oh, brother. We’ve arrived in Port Townsend for a quick getaway from Seattle. One of the highlights of this historic seaside port on the Olympic Peninsula for this trip is the Nifty Fiftys Soda Fountain on Water Street. The fun decor is a throwback to the ’50’s when Elvis was King and bobby socks, saddle shoes and cardigan sweaters were all the rage. 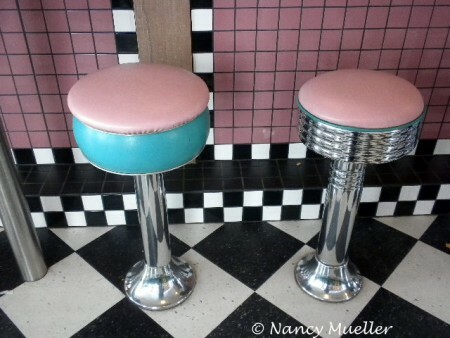 Hop up on one of the retro counter stools next to me and order a burger and fries, or settle for an ice cream sundae, banana split or blackberry malt. Mmm . . .
Now if you really want to embarrass your kids or grandkids, you could start jitterbugging or instead sing along with one of your jukebox favorites: “LaBamba,” “Help Me, Rhonda” or “Don’t be Cruel.” This is one of those hangouts that’s fun for every member of your family: the kids get to sample fun food and you get to revel in nostalgia and the way things were when . . . Okay, here’s a quarter. 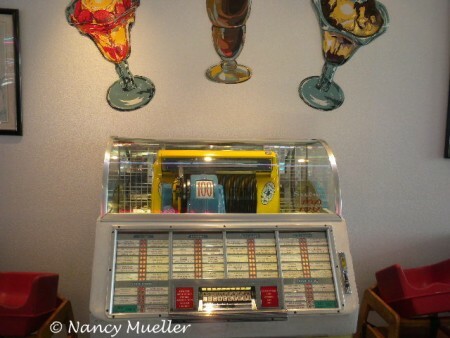 What song is playing on your jukebox, Wanderboomers? Post a comment and let me know. 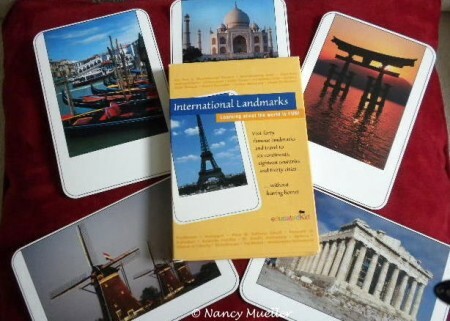 The World Wonders on these cards cover 6 continents, 18 countries and 30 cities. A challenging activity for any of us would be to identify what we think the 40 landmarks are before even looking at the cards. Go ahead. I’ll give you two minutes to write down 40 world renowned landmarks. Ready? On your mark, get set, GO! No fair peeking at the list at the end of this blog until you’re done. Although the photography could be more appealing, the cards provide a fun way for both kids and adults to learn about the sites. The deck comes with a brief list of cross-cultural activities to expand upon the images and inspire further discoveries. I had intended to provide a link for the cards but alas! They’re no longer in print. 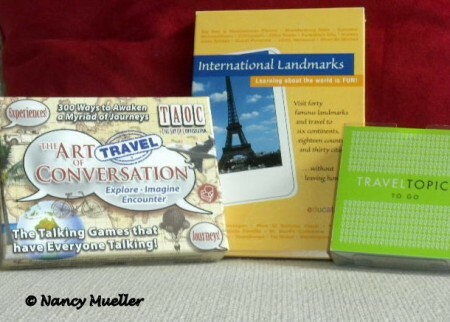 However, I did discover an alternative: Rand McNally Schoolhouse World Facts & Landmarks Flashcards and Games. And this deck includes 44 world landmarks. Okay, you know what’s coming. Go ahead. I’ll give you another 30 seconds to come up with 4 more landmarks to add to your list. You did make a list, didn’t you? You may wonder how successful I was in using any of these card decks to stimulate conversation with my tween on our road trip. Sigh. Not much, I’m afraid. But I like to think I planted a few seeds for thought and later discussion. And I learned something, too. That sometimes the best times together come from simply breaking out of our everyday routines and enjoying the drive in silence. How many of these landmarks made your list? How many have you seen, Wanderboomers? Leave a comment here to let me know how you did and to share your favorite sites. 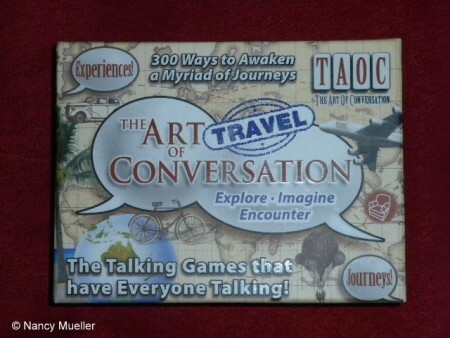 The Art of Travel Conversation scores an A+ on packaging design. You can’t help but be inspired by the beautiful art and travel words gracing the cover of this deck of cards. Comprehensive and sophisticated in their approach, Australian authors Keith Lamb and Louise Howland focus on “travel discussion that involves both serious thought and fun.” Clearly, the objective is not only to ignite conversation, but also to increase players’ knowledge and understanding of the world. Topics include history, politics and geography, environmental awareness, areas of travel interest and creative pursuits. Each card contains three questions or imagination-starters, ranging in difficulty from elementary to advanced levels. The cards come with a 32-page booklet filled with tips for using the cards and an expansive section on word definitions, together with descriptions of places and landmarks, providing a strong educational component. 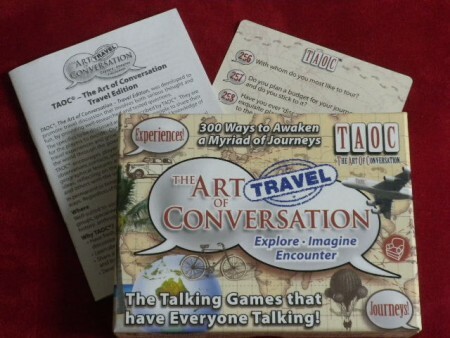 The addition of three blank cards encourages players to generate their own questions based on their travel experiences or interests. Though the cards are presented as questions that can be used with children as young as five, I find that they are best suited to those with advanced travel vocabulary and more travel experiences under their belt. Even though the first level of questions targets elementary-age children, younger kids will need adults to explain or rephrase many of the statements, quotes and questions. Many thanks to authors Keith Lamb and Louise Howland for the opportunity to take these cards for a practice run.